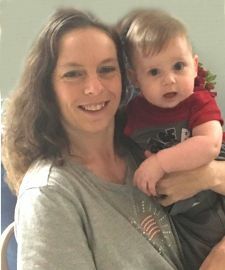 Amy Diane Minter, age 42, and son, Robert "Robby" Samuel Vincent Schultz, age 18 months, of 169 Pattie Lane in Maysville, North Carolina died tragically in a car accident in Hubert, North Carolina, late Thursday evening on March 7, 2019. A double funeral service will be held at 2:00 PM on Wednesday, March 13, 2019 in Fair Funeral Home’s Chapel with Reverend Torrey Easler officiating the service. Interment will follow the service in Dan-View Cemetery. The family will receive friends Tuesday evening from 6 – 8 pm at Fair Funeral Home and other times at the residence of the Amy’s Mother, Maria Carter; 141 Leisa Lane in Stoneville, NC . Amy is preceded in death by her two sons, Thomas Kullberg and Robert “Robby Schultz. Left to cherish Amy’s memory is her children, Richard and Elizabeth Kullberg; her mother, Maria Land Carter and step-father, James of Stoneville; her father, Sam Minter of Eden; her brother, Shane Minter of Eden; step-sister, Mandy Whitley; her fiancé, Phillip Schultz of the home in Jacksonville, NC; and “Special Mother and Father”, Janine and Robert Schultz of Jacksonville, NC; several aunts, uncles, nieces, nephews and extended family. Left to cherish Robby’s memory is his father, Phillip Schultz of the home in Jacksonville, NC; half brothers, Christopher Pickering and Richard Kullberg; half sister, Elizabeth Kullberg; paternal grandparents, Robert Schultz and Janine Schultz; maternal grandmother, Maria Carter and step-father, James Carter of Stoneville and maternal grandfather, Sam Minter of Eden; several aunts, uncles, cousins and extended family. Along with Robby’s mother, Amy Minter, he is preceded in death by his half brother, Thomas Kullberg. The family wishes to extend a special thank you to their grateful and compassionate friends and family that have supported them during this difficult time. “We love you all”, from the family.